One of the interesting opportunities newspapers present is the ability to read news with hindsight. 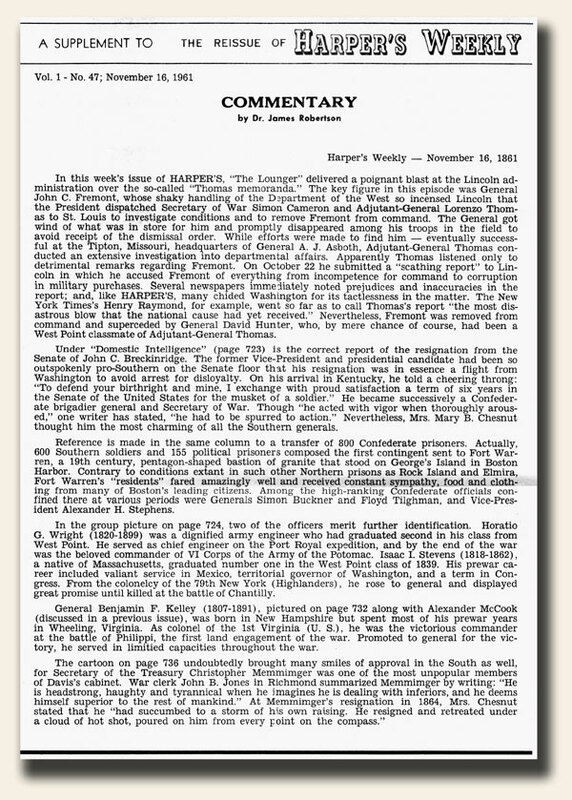 The early edition of the “Dallas Times-Herald” newspaper of Nov. 22, 1963 (see below), the edition prior to the later edition reporting the assassination, has much coverage of JFK’s visit to Texas and the excitement around his planned visit to Dallas later that day. One ironic headline on the front page reads: “Secret Service Sure All Secure” with the article providing much detail on the security efforts to make for a safe visit to Dallas. 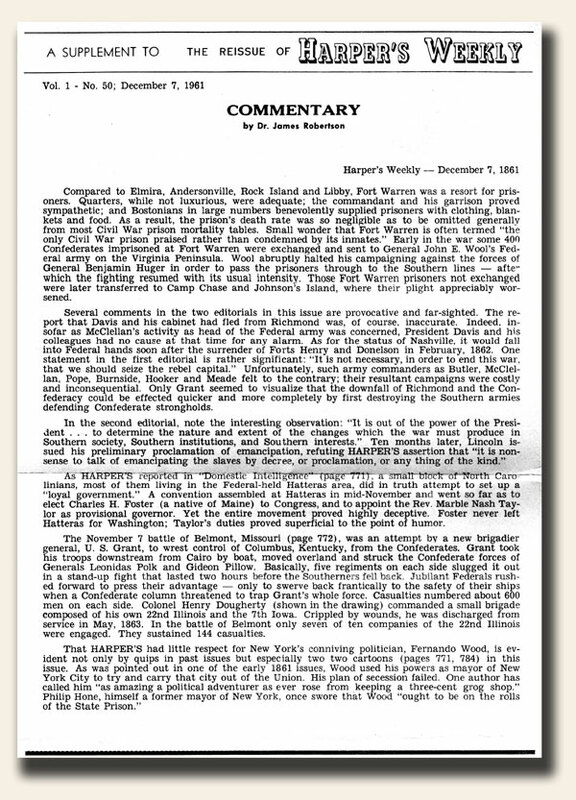 This week we continue with the our reflection upon the Civil War events of 150 years ago… as seen through the eyes of the original readers of the Harper’s Weekly issue printed for November 23, 1861. 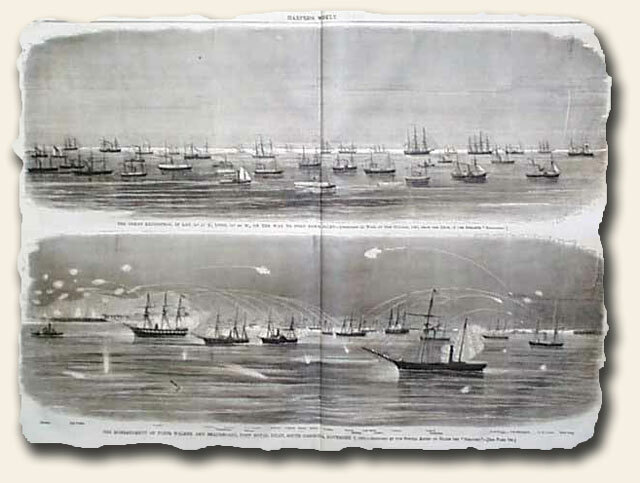 This week we continue with the our reflection upon the Civil War events of 150 years ago… as seen through the eyes of the original readers of the Harper’s Weekly issue printed for November 16, 1861. Today’s issue (July 20, 1861) has the front page taken up with two prints on the progress of “Filling Cartridges at the U.S. Arsenal at Watertown, Mass.”, which involves a surprising number of women. There are two interesting pages with a dozen prints of “Scenes About Camp” showing some of the activities while in recreation (dancing & acrobatics!) as well as practicing for warfare. These scenes offer a different view of soldier life; one away from the battle field. I can imagine relaxing & recreation is a welcome diversion. One print has a scene of soldiers with Hagerstown, Maryland, in the background, and a few other prints have scenes of Harper’s Ferry, just a few years after the John Brown raid. 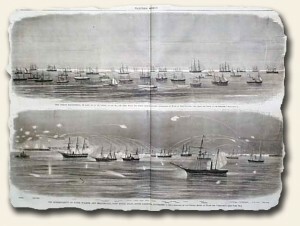 Very impressive is the doublepage centerfold showing “The Navy Yard at Brooklyn…” which shows several massive sailing ships. And yet another print shows that not all soldiers wear the traditional garb, as “Irregular Riflemen of the Alleghanies, Virginia” are in frontier clothing. How can those involved in a fight tell the enemies from their fellow soldiers? Today’s travels landed on a nice surprise! The Middlesex Gazette dated June 6, 1811 carries a lengthy letter by Commodore John Rodgers to the Secretary of the Navy dated May 23, 1811. 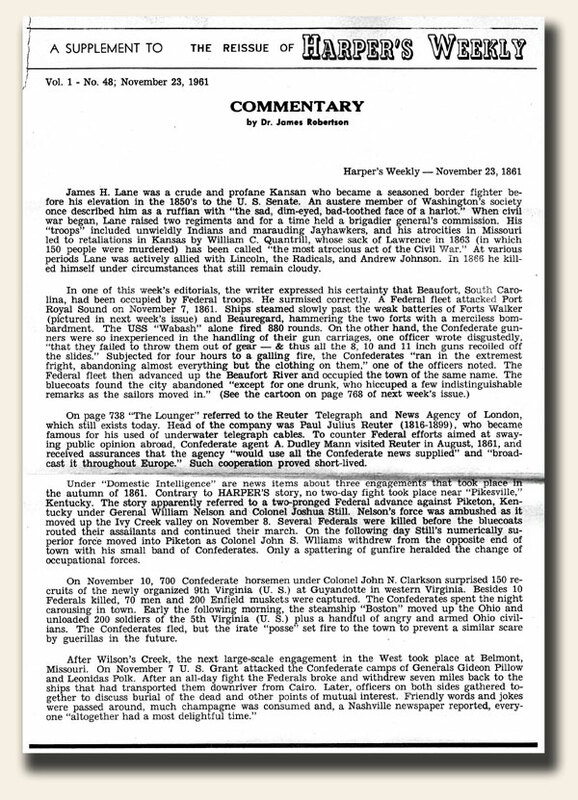 This was referencing a confrontation between his frigate and a Britannic which at first would not identify itself, and then was revealed to be Little Belt. 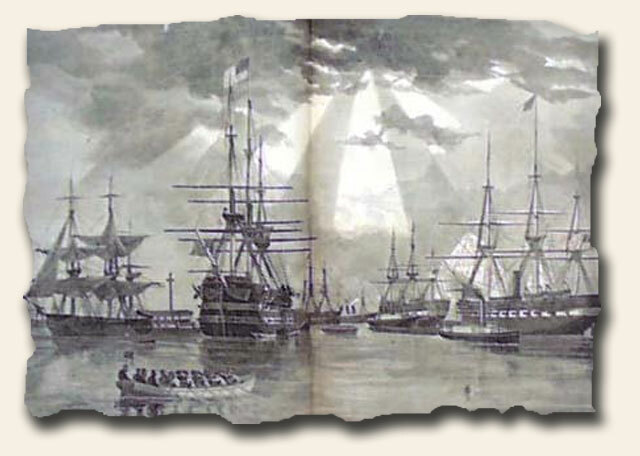 This incident furthered the tension between Britain and the United States which led to the War of 1812. 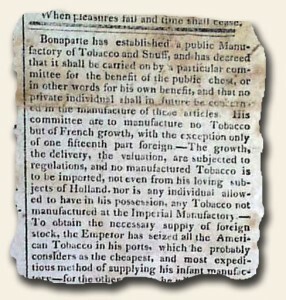 Also in this issue is the reporting that Bonaparte had established a public Manufactory of Tobacco and Snuff. 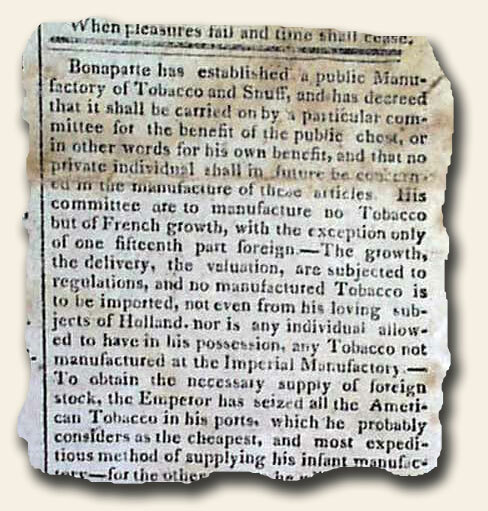 This would be carried on by “a particular committee for the benefit of the public chest, or in other words for his own benefit, and that no private individual shall in future be concerned in the manufacture of these articles…” He would control what type and where all the tobacco would be purchased, etc. Does it sound a little self-serving?? “…failed by a single accident, by a single mistake–that sad one at Gettysburg…But after all, the depression which its failure produced on the public mind was more than was warrantable. The result was not a defeat, it was not a loss; it was only not a victory, not one of the most brilliant triumphs ever recorded. It was little else than a disappointment of extraordinary expectations…”.